ACIDWINZIP is the featured artist at Provenance Gallery during the month of January. 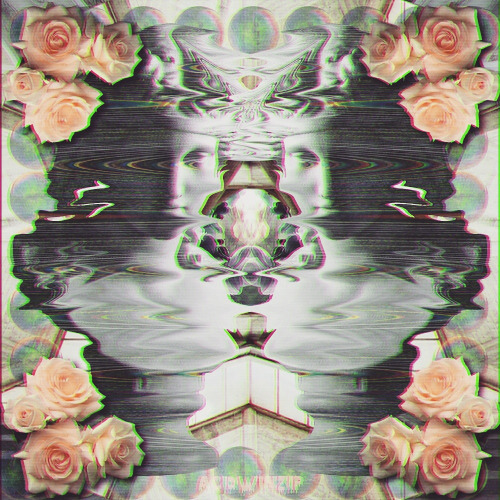 Her digital collages are inspired by nostalgia, Internet culture, Religion, and Art History and are comprised of computer-generated images and other elements, cut and pasted onto a digital canvas. The work is mostly a humorous take on modern internet consumer culture, our obsession with nostalgia and the internet persona. It explores the contrast of traditional art -vs- modern computer-generated art and remixing the two to create something new. Read on to learn more about her work and influences. What are influences on your work and artistic practice? Nostalgia, internet culture, graphic design from the 80’s and 90’s, Religion, and Art History are the primary influences in my art. 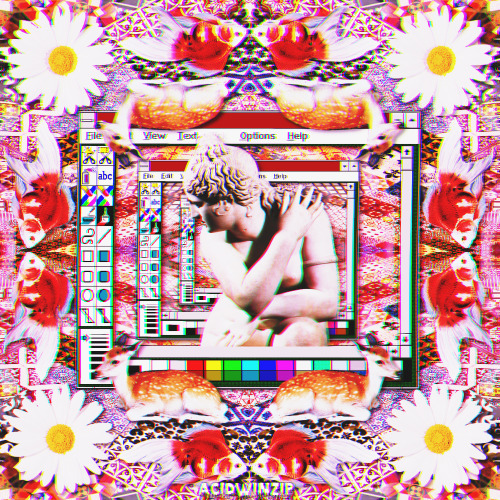 I was deeply inspired by the Vaporwave art genre starting out. I had never seen anything like it and wanted to make my own art, as I was already a part-time graphic designer at the time. I made very generic stuff at first, mostly to pass the time. I was constantly creating and when I started it wasn’t very good. I would make a piece every day and since I was creating as often as I was, I got better a lot quicker. I also figured out what I liked and discovered that I had a specific style all of my own. I have a very good sense of what kind of artist I am now. Now, instead of posting daily, I create maybe once or twice a week. What drives me is the growth that comes with creating. My art has changed so much in the last year. I am using new compositions and new ideas. I’m excited to see what I’m going to be up to next. I felt like this lost wandering artist for so many years. Now that I have a direction and have found a path, I want to see how far that path goes. Also, I am not made for a 9-5 desk job. I’ve done that gig and I was miserable. After I quit my desk job, I was like, “I never want to do that again.” I felt that if I applied myself to something I love, it would grow to something that would hopefully become my life’s work. I am highly influenced by the Baroque Art Period and Greek Hellenistic sculpture. I love dramatic art. I love taking elements of those periods and remixing them with images from the 80's and 90's. I am deeply inspired by beauty, chaos and drama in traditional art, but also by soulless consumerism in modern day American culture. Finally, I admire the friends that I have made on Instagram through my art. No joke, they are my greatest inspiration. These artists and musicians inspire me everyday and I have so much respect for them. Acidwinzip is a multimedia project developed by artist Ursula Zavala with works in digital and video art. that began November 2015 as a personal Instagram art project. She and her partner run VLH Illustration + Design and she is constantly collaborating with other Instagram artists. Her work is primarily web-based and you can see more of her work by visiting her website www.acidwinzip.tumblr.com or by following her on instagram @acidwinzip. "Stellar" design by Sky and Stars.